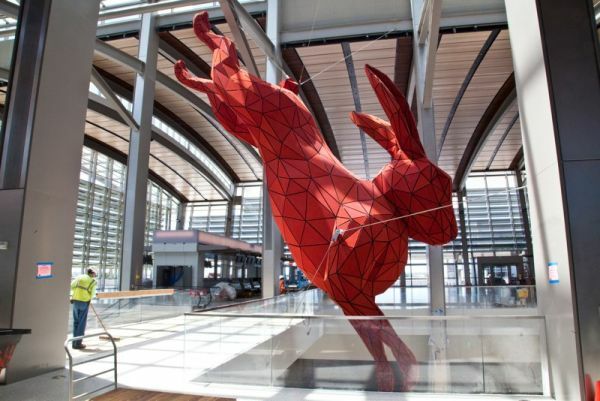 How do you fabricate and suspend a 56-foot-long rabbit? 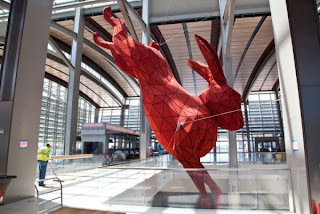 Kreysler & Associates solved this challenge for Lawrence Argent's whimsical aluminum sculpture in the new terminal of Sacramento International Airport. Read the fascinating details in A/N Blog . . . Thanks Rhino. This was a fun and interesting project and we couldn't have done it without Rhino. We do a lot of what's being called "digital fabrication" these days but I have to say this was the most intensive one in terms of coordination since the aluminum was all cut off site at a friends boat building company in Tacoma. Bravo Rhino! I agree - Rhino was invaluable. Perfect for managing the many complex digital aspects of fabricating this beast. Having an easy scripting interface for doing a lot of highly repetitive steps was key.